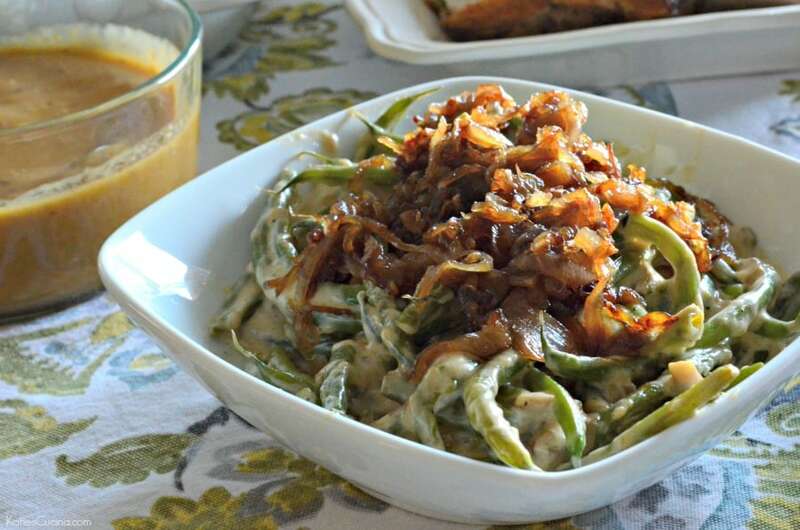 Enjoy the classic green bean casserole from scratch with fresh ingredients and without any cans and best of all this recipe is gluten free! We love green bean casserole in our house. We only ever have it on holidays because it can be so fattening. It’s a holiday indulgence for sure. I’ve grown up on the canned variety. I will be the first to tell you that I do not knock the canned version. I love the canned version. I have a cousin who has a gluten-allergy and every year I feel bad that she can’t indulge in the same green bean casserole that we are all enjoying. Years ago, she use to be able to enjoy that same canned casserole. But over the years she has developed a pretty severe gluten allergy. So I made a note to myself that this year I would be making a from-scratch gluten free green bean casserole. Oh my gosh you guys, did I hit this one out of the park. Even my husband who has been a converted canned casserole guy was in love with this casserole. He felt that I hit this one perfectly and so I will be making our canned casserole and this gluten free green bean casserole for my cousin. But to be honest, my husband and I might be enjoying this homemade version right alongside with her. I subbed out the tasty friend onions (loaded with gluten) for crispy pan fried shallots. Just a little butter and shallots–I let them crisp up and the sub works perfect. Freshly chopped white mushrooms are added to the fresh haricot vert and they steam/boil together. 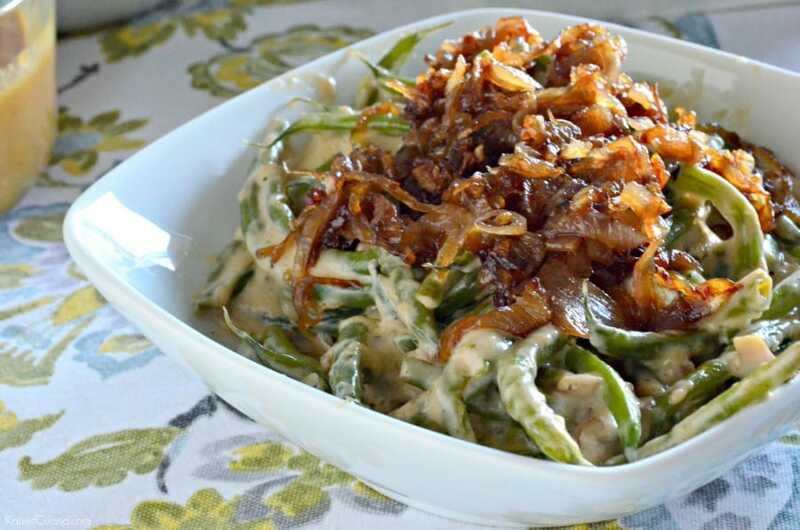 Take the green beans off the stove top and stir in the heavy cream/cornstarch mixture and you’ve got a creamy-decadent homemade from-scratch gluten free green bean casserole. On a side note, I’ve recently been taking note of all the meals I make from scratch… 100% with no cans or boxed foods. Even though this is a little on the rich side with the heavy cream it’s from scratch and I feel better about eating it. I know kind of silly, but I do. I don’t write about my weight-loss journey on here at all (and funny that I put weight-loss and green bean casserole together in the same post), but I’ve continued to eat the same way just up my exercise. And be a little more conscious of what I’m eating. Smaller portions of the same decadent food. That’s where I’m going with this. Don’t feel guilty about indulging this holiday season, just have a smaller portion (and take a family walk after the big meal vs taking a nap). Trust me, your waistline will probably thank me for that advice. 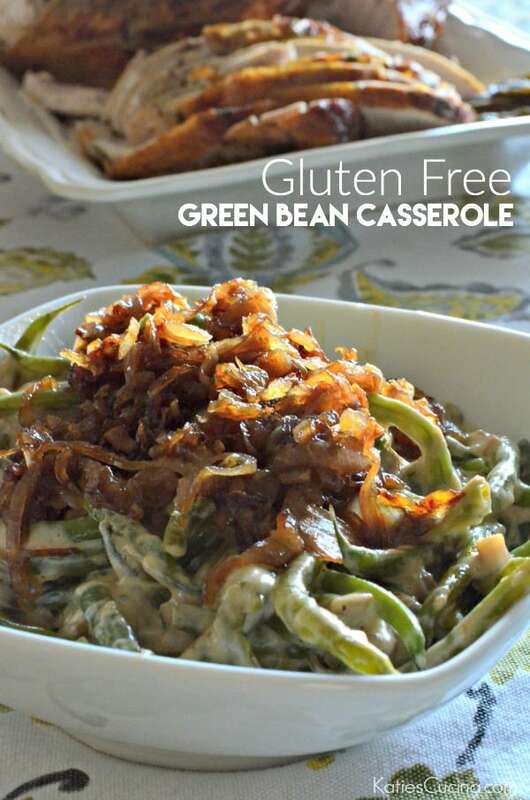 Enjoy the classic green bean casserole from scratch with fresh ingredients and without any cans and best of all this recipe is gluten free! In a saute pan, add 2 tablespoons butter and heat on high. Then add in the shallots. Reduce to medium heat with lid on and cook for 10 minutes, mixing often so that the shallots don't burn. Half way through cooking add the water and mix well. Cook until golden brown and mostly crispy. Remove the crispy shallots from the pan and set to the side. Place the remaining 2 tablespoons butter in the sauté pan, melt, and add the haricot vert and diced mushrooms in the pan with 1/2 cup water. Season with salt and pepper. Cook on high for 8 minutes until tender and most of the liquid has evaporated. In a measuring cup (or bowl) mix together the heavy cream and corn starch. Pour the heavy cream/corn starch mixture into the pan. Turn the heat off and stir. Cover and let sit for 2 additional minutes. 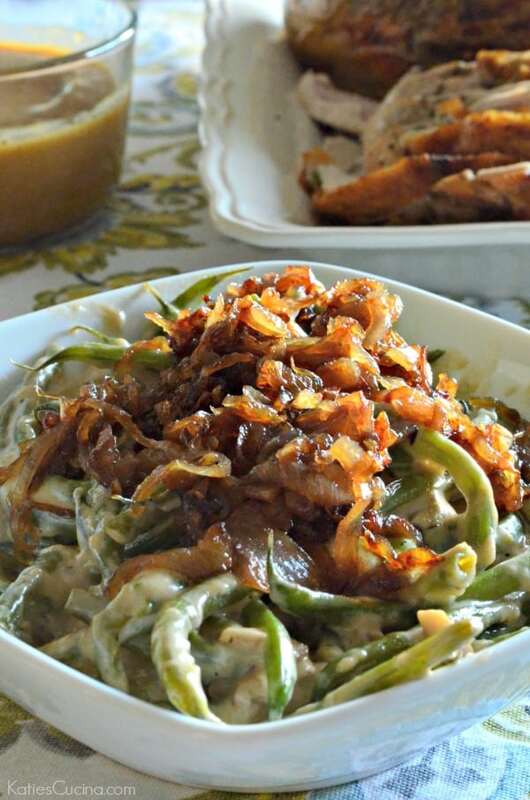 Place the green bean casserole in a serving dish, and top with crispy shallots. Enjoy. if the sauce seems to thick feel free to add additional water to thin it out. if you like the green beans cooked more cook additional time and add in the heavy cream at the end of the cooking time. *do not cook the heavy cream--it will curdle. You must remove the pan from the stove top and mix to avoid curdling.